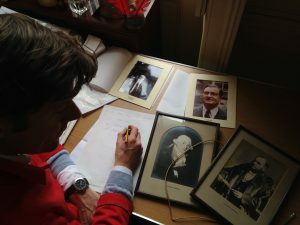 The orchestra has now reached its 21st anniversary year, our archivist Richard Wiltshire reflects on how the LGSO’s archive has been formed, features highlights in the collection and plans for the future to make the items available to researchers. I’m a professionally-trained archivist. Over the past 14 years I have had responsibility in my day job at London Metropolitan Archives, the city and pan-London archive repository for collecting, for collecting, cataloguing, preserving and making available unique historical records relating to London. I love collecting and sorting things into order. This requires an element of detective work and attention to detail – hence I also adore hobbies including stamps, family history and birdwatching (though not at twitcher level). On the subject of detectives there is at least one archivist who has switched career to become a detective in the police force. I joined the orchestra in 2004 to try and play my viola again which had experienced a decade or more of neglect and secondly, to meet the man of my dreams in a friendly environment which would guarantee a shared interest in music. My instinct for collecting soon began and I started to keep each concert flyer and programme. I also collected our Gay Pride Parade T-shirt and saved each weekly ‘LGSO Update’ circulated to orchestra members which continues to this day. celebration which included a small exhibition at concerts. One member had been keeping the Committee minutes, chair, secretary and orchestra manager’s files right from foundation in 1996. I knew the history of the orchestra and its development was going to be well-documented. Two years later I found that man. The archive now includes minutes, correspondence, accounts, handbooks, flyers, programmes, press and some recordings. 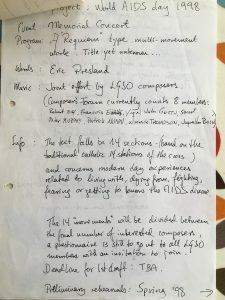 Highlights include ‘Queer Notes’, the orchestra’s newsletter to members; planning and programme for the concert ‘FREE Anti-Requiem’ for World AIDS Day 1998. Told in 14 sections based on the traditional Catholic stations of the cross the piece was created by members of the orchestra, covering ‘modern day experiences related to living with, dying from, fighting, fearing or getting to know the AIDS disease’; and photographs of the orchestra’s first international tour to Croatia in 2004 as part of Queer Zagreb festival supporting the LGBTQ community in Eastern Europe. At the last Annual General Meeting in 2016 the orchestra agreed to add a line to the constitution on safeguarding our heritage. This includes current plans to deposit the collection this year with a publicly accessible archive repository. There is more scope make the orchestra’s archive complete. Many concert programmes from 1996-2003 are missing or in poor condition and there are missing newsletters and few performance recordings deposited. We’d be delighted to hear from you if you have old programmes, recordings or other material relating to our history.